In the previous post, we considered the basics of bundle adjustment (BA) and discussed how to obtain the expressions for the jacobian matrices for the case of perspective projection. Let’s now look at these expressions in more detail. The table below lists the parameters each element of the jacobian matrix depends on. 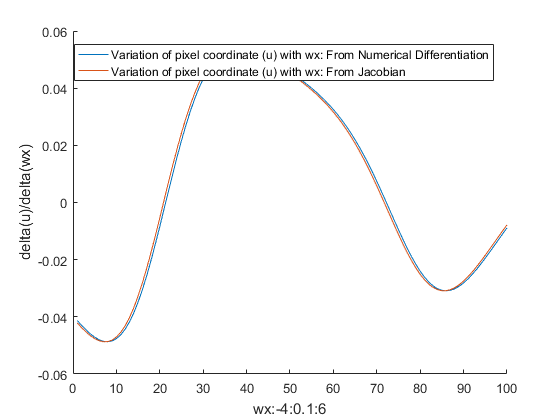 Jx_wx denotes the partial derivative of the x image coordinate wrt to wx. From this table, we can make the following observations. Because we assumed zero skew, the variables along the x and y axis do not have any cross-depenencies. These results agree with expressions for the jacobians we obtained in the previous post where we considered the object point in the camera coordinate system and thus avoided the complexity introduced by the object-camera coordinate system transformation. The table above shows the variation of the x component of the Jacobian. The y component follows the same pattern with x, y and u, v interchanged. If you look at the Matlab files containing the implementation of the different elements of the Jacobian matrix (generated by the “matlabFunction” function) you’ll notice that the expressions are very complex. So how to do we know that these expressions are actually correct? 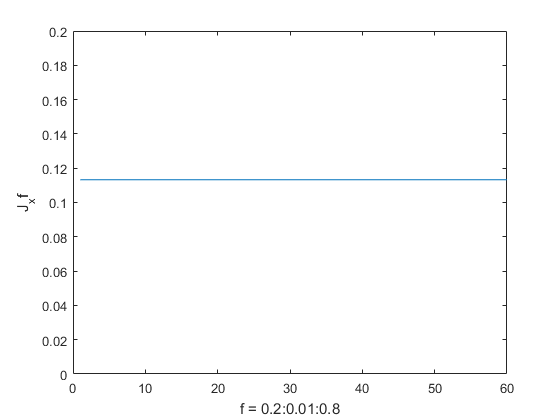 The plot below shows the derivative from numerical computation and the derivative from the jacobian plotted against the independent variable (wx). The other variables that the Jacobian depends upon (X,Y,X, f etc) were kept constant. One can see that the derivative from numerical computation is in close agreement with that computed from the jacobian. As noted in the previous post, we use the axis-angle representation to represent rotations because it is a compact representation and captures the angle and axis of rotation by 3 numbers denoted by . 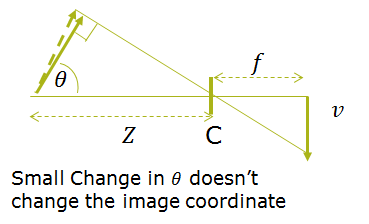 In the axis-angle representation, the angle of rotation is represented by while represents the unit vector corresponding to the axis of rotation. The axis-angle rotation is superior to the more commonly used euler angle representation as it doesn’t suffer from gimbal lock. The relationship between the two representations is quite non-linear. The graphs below show the variation of yaw, pitch and roll when is varied from -4 to 6. We can see that linearly varying one coordinate of the axis-angle representation changes all three euler angles in a highly non-linear way. Lastly, let’s look at some plots of the variation of some of these Jacobians. varies inversely with (the variation is inverse square, but that is hard to see in the plot as the values of ) are quite small. This agrees with our intuitive understanding that depth perception becomes harder as the object moves farther from the camera. The plot below shows the variation of with the focal length. All other variables are kept constant ( ). As expected, does not change with and the value of the jacobian is approximately times that of . 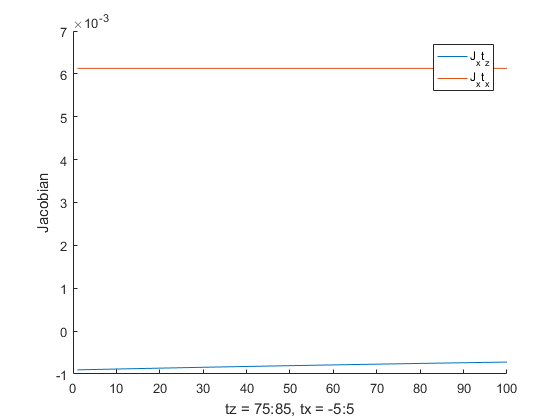 The plot below shows the rotation elements of the Jacobian. It’s important to note that the Jacobians vary a lot, and for certain rotations, some of the Jacobians become zero. I suspect this occurs when the angle of rotation is such that the line of sight from the camera is a tangent to the direction of rotation.